The player takes on the mafia in 1930s New York City in this shooting gallery style arcade game. Versions of the game were released for the Family Computer (1987) and MSX (1988). While Acclaim Entertainment advertised a Western regions release for the NES, console versions remained exclusive to Japan. Seibu Kaihatsu eventually released a follow-up game, Dead Angle. 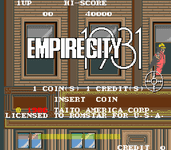 The game is set in 1931 New York City where the player controls a young man who seeks to avenge family members who were killed in a gang shootout. Over a period of several months, the player targets a series of mobsters, culminating with the mafia boss. The player moves a crosshair around the screen, which pans to cover a larger panorama, to aim and shoot at mobsters, one shot at a time. The mobsters lurk around various areas, including on the street and in windows. An arrow appears that helps direct players to the location of the next mobster onscreen. Players have a limited amount of time to find and shoot each enemy. If time is running out, a speech bubble appears counting down the last few seconds. When the countdown reaches zero, the player is shot and the screen pans to reveal the location of the enemy. A Shield button is available as a last resort to avoid being shot if a player cannot target an enemy before the countdown reaches zero. Pressing the Shield button skews the crosshairs away from the enemy while the protective shield is up. Levels are cleared after a set number of mobsters are eliminated. In the game's final level, the player has only one opportunity to assassinate the mob boss as he walks in front of windows in a building. After the final level is completed, the game loops back to the beginning. The Famicom port is largely the same as the arcade version. One notable difference is that the player's progress can be restored any time in the Famicom version by using a password system of four numbers and/or letters. Source: Wikipedia, "Empire City: 1931", available under the CC-BY-SA License.